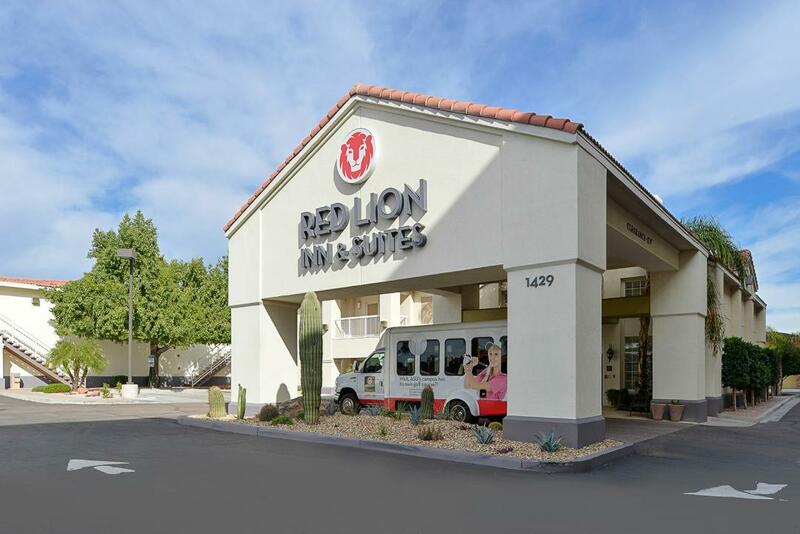 Located in the vibrant college town of Tempe, Arizona and minutes from eastern Phoenix, Red Lion Inn & Suites is the best value hotel in the region. Convenient to Arizona State University (ASU), Red Lion Inn & Suites Phoenix-Tempe features well-appointed hotel rooms and suites, a convenient, complimentary airport shuttle to Phoenix Sky Harbor International Airport (PHX), and thoughtful amenities to make your stay in southern Arizona the best ever. You'll also find plenty of on-site recreation, including BBQ grills, a putting green, an outdoor pool, a spa, and a patio. Whether you want to cook up a hot, tasty meal or spend an afternoon lounging under the sun, Red Lion Inn & Suites is Tempe's best value hotel. Red Lion Inn & Suites Phoenix-Tempe offers some of the most enjoyable and convenient amenities at our hotel near Arizona State University. Whether you're a business or leisure traveler, enjoy our complimentary airport shuttle to and from the Phoenix Sky Harbor Airport. Start your mornings with our signature, free breakfast and stay connected with complimentary WiFi. After relaxing in our Tempe, AZ hotel rooms or exploring the city of Tempe, check out the resort-style services and amenities offered at our Arizona State University hotel. Complimentary shuttle to Tempe Marketplace, ASU Campus, Light Rail Tramstop, & Mill Ave.
For the convenience of our guests, Red Lion Inn & Suites Phoenix-Tempe near ASU offers complimentary transportation to and from Phoenix Sky Harbor Airport via our private airport shuttle. From arrival to departure, our hotel near Phoenix Sky Harbor Airport prides itself in accommodating our guests with efficient transportation in Tempe. For guests who prefer to drive, we have partnered with the Budget Rent-a-Car across the street. Stay at our Tempe hotel to take advantage of discounted car rentals and complimentary parking. Satisfy your appetite any time of day with delicious dining options in the Tempe / Phoenix region when you stay at Red Lion Inn & Suites. From a hearty breakfast buffet to casual lunches to elegant dinners, dining at Tempe's eclectic restaurants are a treat for your tastebuds. 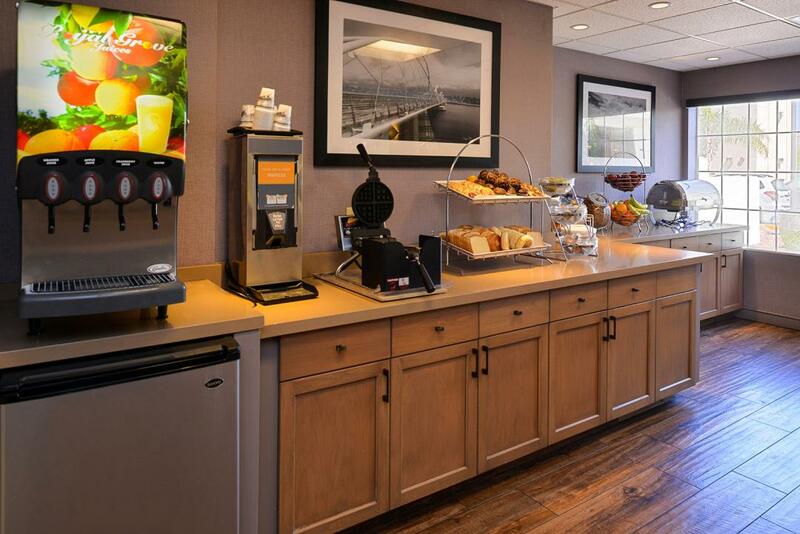 Power your morning with a complimentary breakfast buffet, served fresh each day. From 6am to 10am, Red Lion Inn & Suites Phoenix-Tempe serves our signature complimentary breakfast (menu may vary day to day). Located in the heart of downtown Scottsdale, the Mission blends old world charm with modern elegance. Indulge in their award-winning Latin cuisine and tequila bar in one of most romantic spots in Arizona. If you're looking for the best place in town to grab a bite to eat while you sip a cocktail, look no further than Citizen Public House. This trendy spot nestled in Old Town Scottsdale is home to award-winning cuisine and creative cocktails. A favorite among Arizona State University students, Four Peaks offers award-winning craft beer and delicious bar food. Meet your friends for happy hour at this popular bar, equipped with multiple flat screen televisions. Nestled in the heart of downtown Tempe is House of Tricks, a remodeled 1920's cottage turned restaurant. This seasonal restaurant features a quiet, sun-dappled patio, a tree-covered bar and historic bungalows. Located in Old Town Scottsdale, 5th and Wine is a wine bar serving some of the best chicken pesto pasta, Portobello burgers and bruschetta you'll ever try. Known locally as the "Best Dive Bar" in Tempe, Yucca Tap Room features local art, live music, games, tasty food and a whiskey room. Conveniently located near Arizona State University and the Phoenix Sky Harbor Airport, Red Lion Inn & Suites Phoenix-Tempe boasts 1,320 square feet of sophisticated event space in Tempe, AZ, for sales conferences, product presentations and training seminars of up to 60 guests. Whether your gathering is business-related or a special celebration, allow our event planning team to coordinate your event in one of our two Tempe, AZ event spaces, equipped with audio/visual services and complimentary Wi-Fi. From the minute they arrive to the second they depart, ensure a smooth and enjoyable vacation for your guests with our assisting amenities, including complimentary airport shuttle, complimentary breakfast and full access to our state of the art fitness center, putting green, outdoor pool and hot tub. From historic and cultural sites to shopping destinations and family attractions, the Tempe/Phoenix region offers plenty of things to do. Our hotel in Tempe is convenient to the city's most popular attractions including the Downtown district and professional sports teams, as well as a host of hidden gems. The Desert Botanical Garden is home of Arizona's stunning plants and flowers. Come learn about the Sonoran desert climate and how it affects the desert plants in Arizona. The internationally renowned Heard Museum proudly partners with hundreds of Native American artists, tribal leaders and elders to share stories and traditions. Visit and be amazed by vibrant exhibitions, authentic festivals and exceptional shops. The Phoenix Art Museum is the largest visual art museum in the Southwest, featuring more than 17,000 works of American, Asian, European, Latin American, Western American, modern, and contemporary art and fashion design. The ArtFest™ of Scottsdale is one of the valley's most popular events, bringing 150 artists from all over the country into Downtown Scottsdale. This event features fine art, local authors, handmade crafts, live music, delicious food, and hands-on kids activities. Known for cutting edge contemporary art, the ArtFest™ of Scottsdale cannot be missed. House of Tricks is a remodeled 1920's cottage turned restaurant that, featuring a quiet, sun-dappled patio, a tree-covered bar and historic bungalows. The restaurant closes the beginning of Arizona's scorching summers and reopens every August. With scenic trails and minimal elevation, Papago Park is one of the loveliest places for hiking and mountain biking. The Phoenix Zoo and Desert Botanical Garden is also conveniently located in the Park. The oldest bar in Scottsdale, Rusty Spur Saloon is an authentic cowboy hangout with swinging doors, live music and fantastic burgers. Celebrities, tourists, locals and real cowboys all flock here for the delicious food and Wile West atmosphere. Open from 10:00 am to 5:00 pm daily, the Arizona Science Center offers more than 300 hands-on, interactive exhibits, a state-of-the-art planetarium, a giant-screen theater and live demonstrations. Show your family the fun side of science. Located in Papago Park is the Phoenix Zoo, featuring four American Southwest flora and fauna trails, a petting zoo, and a Safari Train. Bring the family for some educational animal fun. The Phoenix Children's Museum is a spacious sanctuary for engaging the minds, muscles and imaginations of children. With the philosophy that every child knows how to play at their own developmental level, these interactive exhibits do not come with instructions. 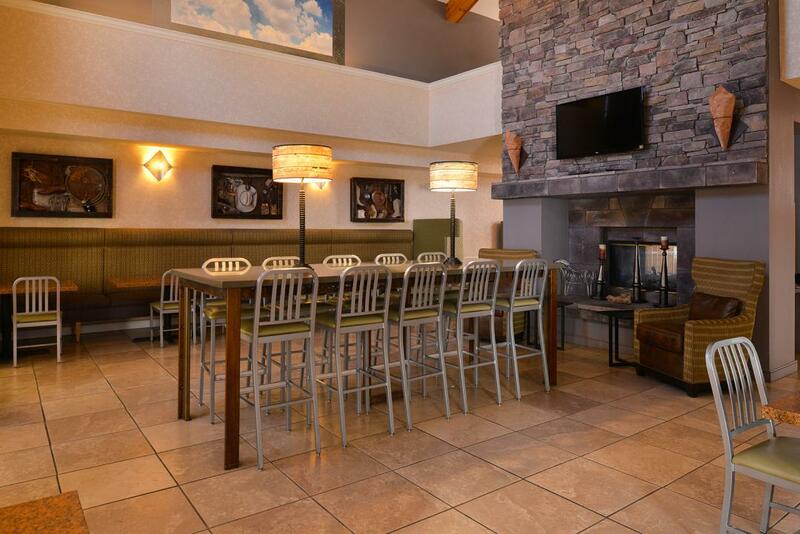 As one of the best Tempe hotels near ASU, Red Lion Inn & Suites Phoenix-Tempe is the perfect choice for campus visits. Throughout the year - from graduations and parents' weekends to alumni reunions and sporting events - our great rates, personalized service and contemporary guestrooms make us a favorite among hotels near ASU for Sun Devil students, families, friends and alums. Enter "ASU" when booking your room at our hotel near ASU Tempe for a special discount on Arizona State University Parent & New Student Orientation. Established as a small teaching college in 1885, Arizona State University has grown into the largest university in the nation with several campuses spread throughout the Tempe metropolitan area. 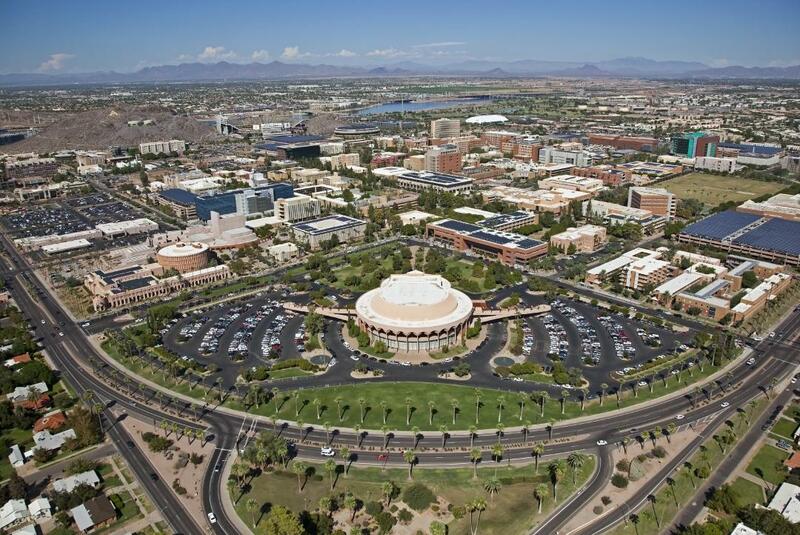 Even if you're not in town for an ASU event, the scenic campus is worth a visit. The grounds have officially declared an arboretum with tags marking many of the trees and plantings that showcase desert and tropical flora from around the world. This living museum houses dozens of reptiles, including a comprehensive sampling of the poisonous snakes of Arizona. The Arts Center is home to the ASU Art Museum, which has a fine permanent collection and an active guest artist program. The museum gift shop is a great place to get beautiful and unusual gifts. The vast collection is housed mainly underground in the center of campus. It has many unique features, including a children's drama collection, various exhibits and rare and valuable works available to the public in the Luhrs reading room. Where else can one walk in and request to see a page from a Gutenberg Bible? This striking facility is a Frank Lloyd Wright-designed theater hosting international talent, Broadway shows and local entertainment. One of Wright's last architectural designs, the auditorium was originally slated for Baghdad before being built in the Valley of the Sun. Extraterrestrial exhibits include the Thermal Emission Spectrometer experiment that was sent aboard the Mars Global Surveyor spacecraft when it launched in November 1996. The facility also has a visitor area with displays about Mars and a television continuously tuned to NASA TV. View minerals, gems and fossils from Arizona and around the world. The Museum also has a six-story Foucault pendulum, remains of a Colombian mammoth excavated in 1985, a T-Rex brain cavity and many other rare and extinct mammalian fossils, including those of saber-toothed cats. 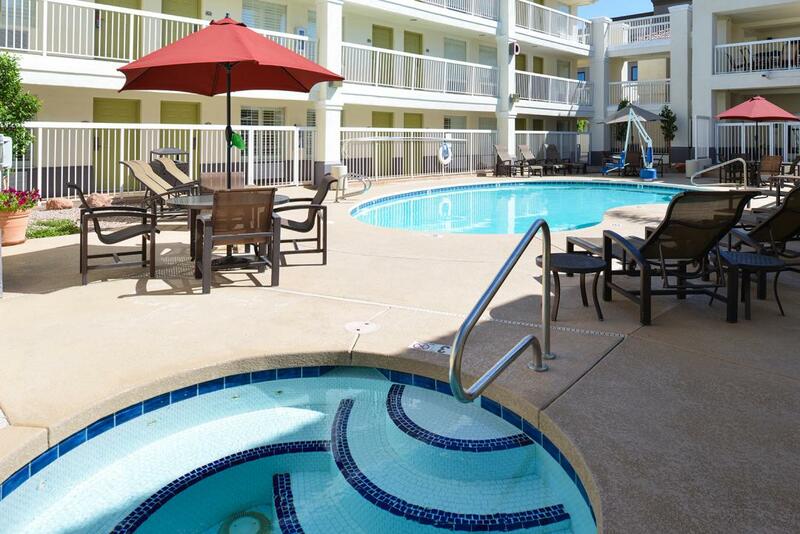 Red Lion Inn & Suites Phoenix Tempe is located only a mile away from downtown Tempe. Surrounded by the majestic Sonoran Desert, downtown Tempe provides a contemporary cultural scene and boundless outdoor recreation with Old West flair. For those who love the outdoors, downtown Tempe is known around the world for its wide variety of recreational pursuits, including golf, biking, horseback riding, rock climbing, and even hot air ballooning. On any of Tempe's 325 days of sunshine a year, you'll find locals and visitors teeing off on the region's 200 championship golf courses, hiking through the scenic Papago Park and boating across Tempe Town Lake. When it comes to culture and entertainment, Tempe is just as multifaceted. Take in an off-Broadway show or musical at Arizona State's Gammage Theater or spend an evening at the symphony or ballet. Browse world-class museums featuring Native American art and artifacts, and indulge at fabulous international restaurants. As one of only eight cities in the country to field teams in all four major professional sports -including the MLB's Arizona Diamondbacks, the NHL's Phoenix Coyotes, the NBA's Phoenix Suns and the NFL's Arizona Cardinals-Tempe serves as a paradise for diehard Arizona sports fans. For shoppers, our Tempe, AZ lodging is centrally located from some of the finest malls, boutiques, antique shops, outlet and cutting-edge art galleries. While known as a thriving college town, sports center, and shopping destination, Tempe also offers plenty of fun things to do with kids. With more family-friendly attractions in development each year, Tempe, AZ is one of the best destinations featuring something for everyone. Browse our guide to family-friendly Tempe for some of the fun things to do with kids. Located in Papago Park, the Phoenix Zoo is a favorite of kids and parents alike. As the largest non-profit zoo in the country, the Phoenix Zoo features more than 1,200 animals, an array of attractions, including a Children’s Trail and Petting Zoo, and educational programs for kids of all ages. The Phoenix Zoo is also home to several permanent exhibits and incredible experiences including camel rides, giraffe encounters, Safari train rides, playgrounds, water play areas, and much more. Add the SeaLife Arizona Aquarium to your itinerary for a guaranteed good time for everyone in the family. Featuring more than 5,000 sea creatures including sharks, stingrays, and octopi, the SeaLife Arizona Aquarium is the perfect place to discover the undersea world. The aquarium offers interactive exhibits so you can get up close with marine life, a stunning 360-degree ocean tunnel, touch tanks, and a new kid-friendly Dive Adventure Quiz Trail. Designed for kids up to age 10, the Children’s Museum of Phoenix offers plenty of fun things to do while encouraging education and piquing your child’s curiosity. With exhibits designed for all child groups, including babies and toddlers, the Children’s Museum of Phoenix offers experiences ranging from art studios to building experiences to music exhibits, and more! . With tons of shops and places to eat, no wonder it's one of the most popular tourist spots in the area. Arizona Mills features 170 shops and dining experiences as well as exciting family entertainment options, including Harkins Theaters, IMAX, GameWorks and Sea Life Arizona Aquarium. With more than 225 retailers and two million square feet of retail space, Scottsdale Fashion Square Mall is known as a rather unique luxury mall, featuring upscale stores like Neiman Marcus, Barneys New York, Nordstrom, Macy's and the largest Dillard's in the country. The Tempe Marketplace offers live music, fantastic restaurants, kid-friendly fountains, an outdoor fireplace and 1.3 million square feet of retail space. Shop this outdoor market as you stroll along a golden Arizona sunset. For more than 100 years, the Mill Avenue District has been the heart of Tempe, featuring festivals, live music, shopping, dining, coffee shops, Tempe Beach Park and Tempe Town Lake. In addition to Arizona State University athletics, Tempe is also home of four major professional sports teams including the MLB's Arizona Diamondbacks, the NHL's Phoenix Coyotes, the NBA's Phoenix Suns and the NFL's Arizona Cardinals. One of the only few regions in the country to have teams in all four major professional sports, Tempe is home to many diehard sports fans and athletes. Book our accommodations at Red Lion Inn & Suites Phoenix-Tempe to stay close to all the exciting sporting events in Tempe, AZ. Baseball aficionados swear that there's no better ball than spring training (unless, of course, we're talking about game 7 of the World Series). 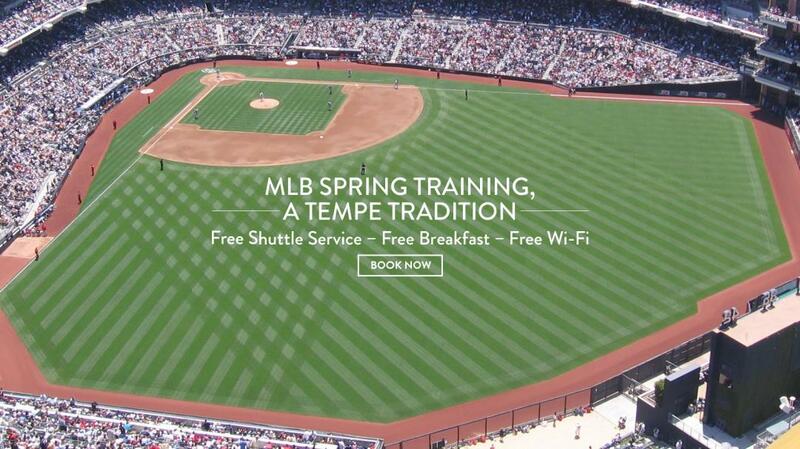 The Cactus League consists of 15 professional teams training in multiple stadiums around Phoenix. Ironman Arizona is a triathlon that runs from Tempe Town Lake, through the Sonoran Desert, to Papago Park. Registration is open to anyone but fills up fast as this race is a qualifier for the big-daddy Ironman World Championship. Dragon Boat racing as an amateur water sport held over the past 2,000 years throughout southern China. Thousands of paddlers and spectators from all over the United States, China, Canada and Taiwan flock to watch hundreds of teams compete in Tempe's version of Dragon Boat racing. With live music every mile, this three-day event is more of a party than a race. The course starts in Phoenix, continues through Scottsdale, and finishes in Tempe. But the real fun is at the children's race, the two-person half marathon relay and the mini-marathon.